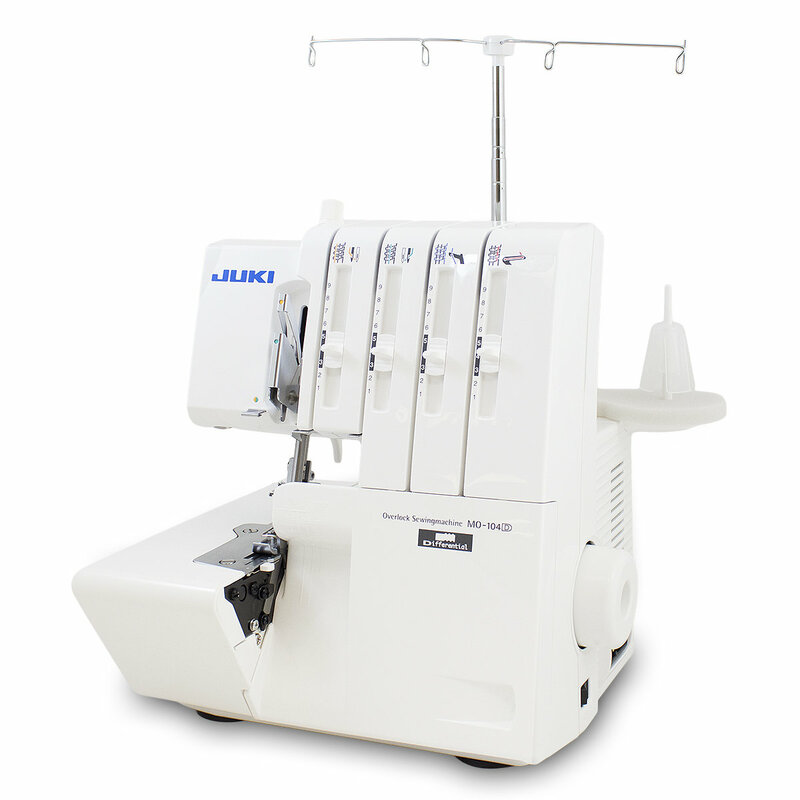 The Juki MO-104D is a 2-needle, 2/3/4-thread overlock serger with automatic rolled hemming and differential feed. With the Juki MO-104D Overlock Serger you can create beautiful finished seams. The Juki MO-104D has a wide variety of patterns, and you can sew both stretchy and knit fabrics. Lay-in Type Thread Tension Slots - make threading easy and efficient. No wrapping. Just follow the color-coded thread path. Automatic Rolled Hemming - can be created quickly and easily with built-in fingertip control. There is no need to change the throat plate or foot. Cutting Width - can be adjusted quickly for perfect seams and rolled edges. Adjustable Stitch Length - is adjusted by the knob located inside the machine. Stitch length ranges between 1 and 4mm. Differential Feed - is easily controlled and adjusted by a dial located on the exterior left-hand side. Juki Sergers have a 2 year electronic warranty on motors , light assembly, wiring, switches, circuit boards and speed control. A 5 year mechanical warranty is for "all other parts" however this excludes "consumable parts" such as loopers, feed dogs, knife blades, bulbs, lamps, presser feet, needles and belts. Juki sergers also comes with 90 days labor period on adjustments good through the Juki dealer the machine is originally purchased from. This warranty is valid only on products used for household purposes. Using this product in a commercial environment voids warranty.